While I was home last weekend Fast Eddy (my dog) and I had a chance to get out and walk in the woods of NW Michigan in the hills above my mom’s house. The steep slopes free of undergrowth were easy to climb. Since the canopy of leaves were not developed, plenty of light penetrated the forest. This is the one time of year that it is fun to explore and see what is actually on the floor of the woods, typically hidden. 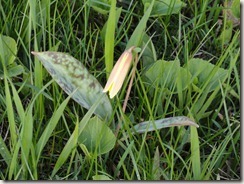 You can’t see much later in the summer once other growth takes off. To be doing a “walk about” was a treat and a fresh change from our daily dog walks in our loca l neighborhood in Appleton. 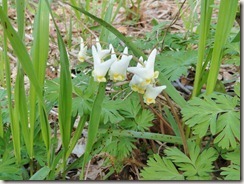 Spring was apparent with the first wild flowers already out. 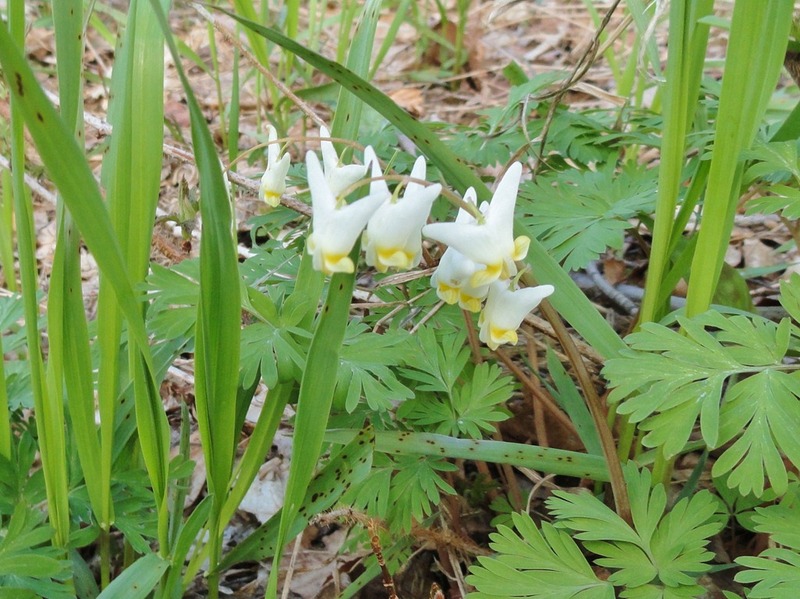 We saw Dutchman’s Breeches (or Boys and Girls) and the Trout Lilly ( yellow flower and blotchy spotted leaves). I was disappointed it was too early for Trillium, by about a week. I surprisingly came across a patch of wild leeks. Well, at least I thought they were leeks. 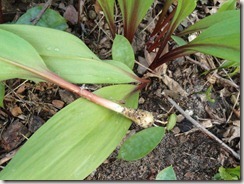 I had to pull one up and it did have the bulb-look that leeks have. I wish I would have pulled a few to make a creamy wild leek/potato soup. 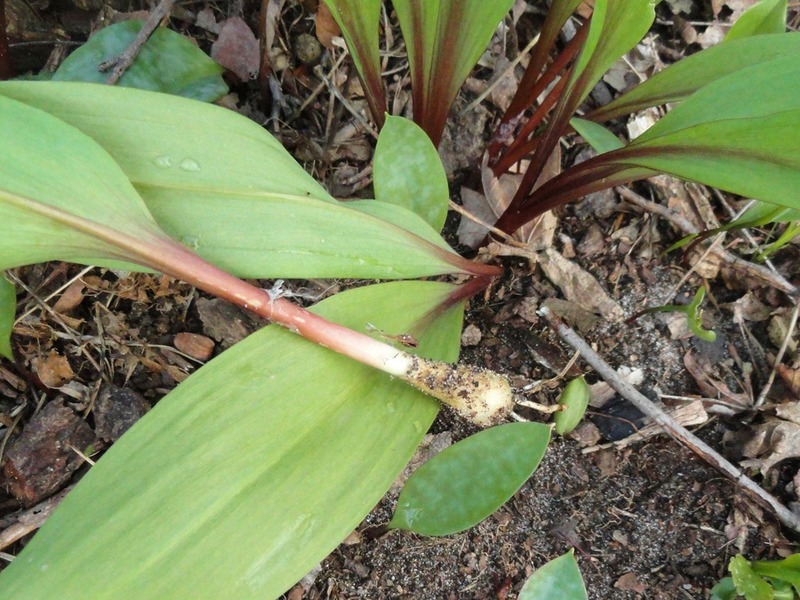 I remember in elementary school that there would always be some kid who would pick some leeks on the edge of the woods of the playground then put them in their locker to take home. Meanwhile they would stink up the entire hallway. 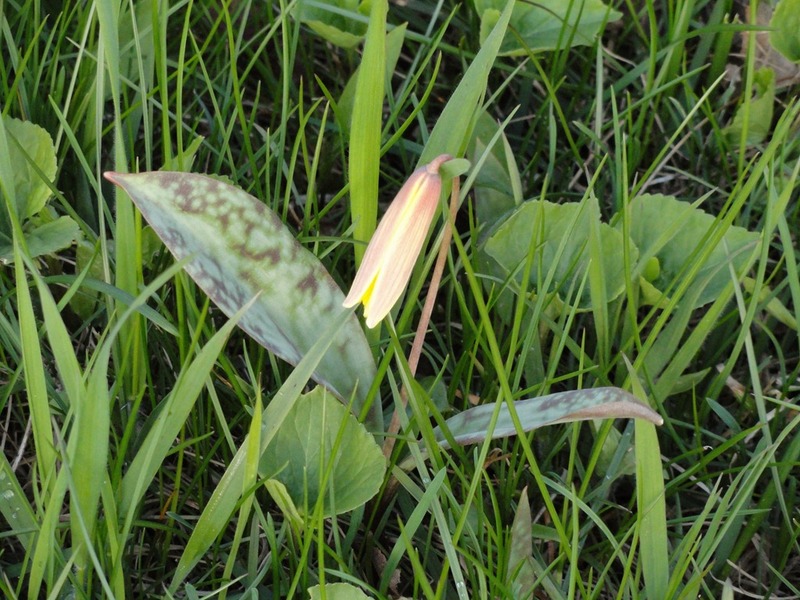 The student would be ask to clean out their locker and possibly go home if they had eaten a few of the reeking wild bulbs. 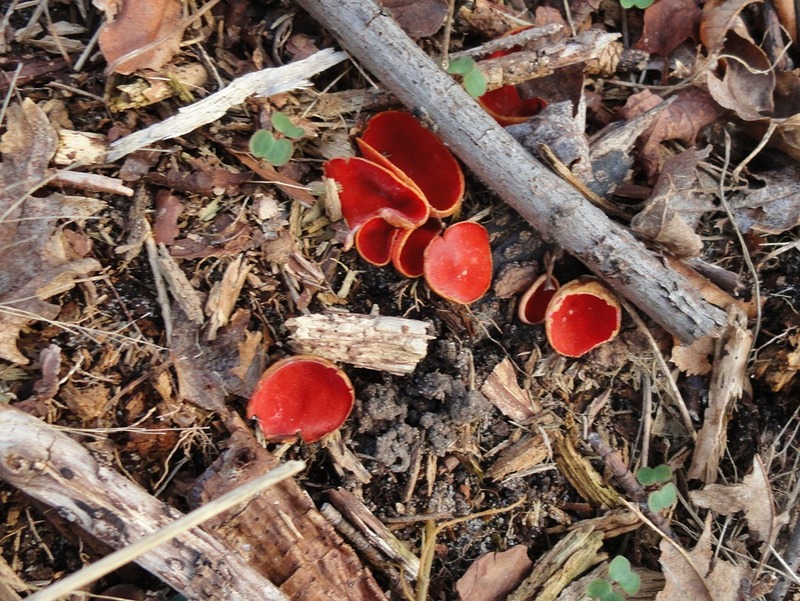 Evidence of on going decay was seen with cup-like deep fungi (Scarlet Elf Cup, Sarcoscypha coccinea, with its brilliant red center) and a layered fungi (Turkey Tail), slowly decomposing the fallen and dead debris, renewing the rich loamy soil. 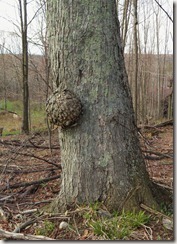 I enjoyed the tree with the bulging growth and little dark spots above its bulbous protrusion. It had a humorous cartoon look to it. I expected it to suddenly come to life as if in a Disney animation and dance around. 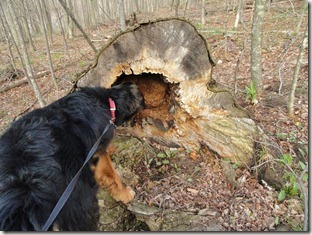 A burl of this type is caused by the invasion of bacteria or virus, or an injury to its trunk, and not unusual to see in the woods. 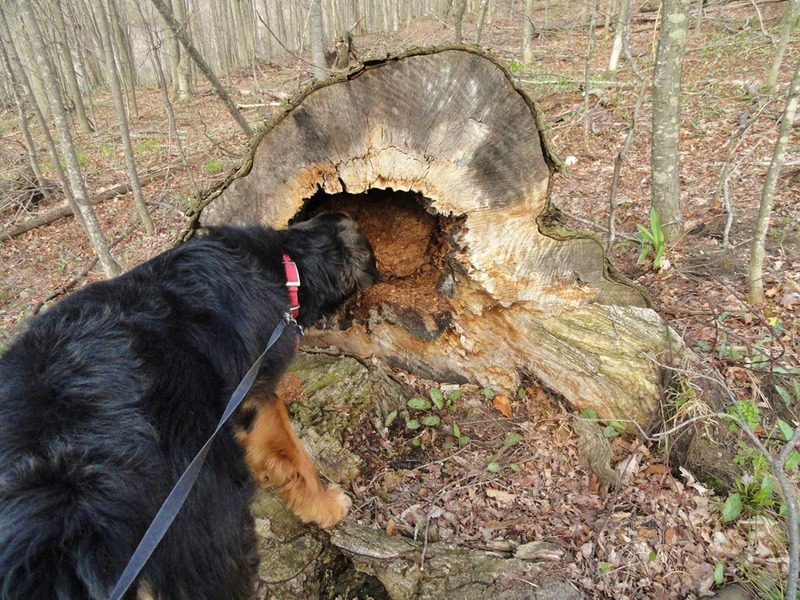 Eddy poked his head in a fallen log, and detected a past inhabitant who possibly spent its winter tucked deep inside until Spring. I had to pull him away from this most interesting find (for him). 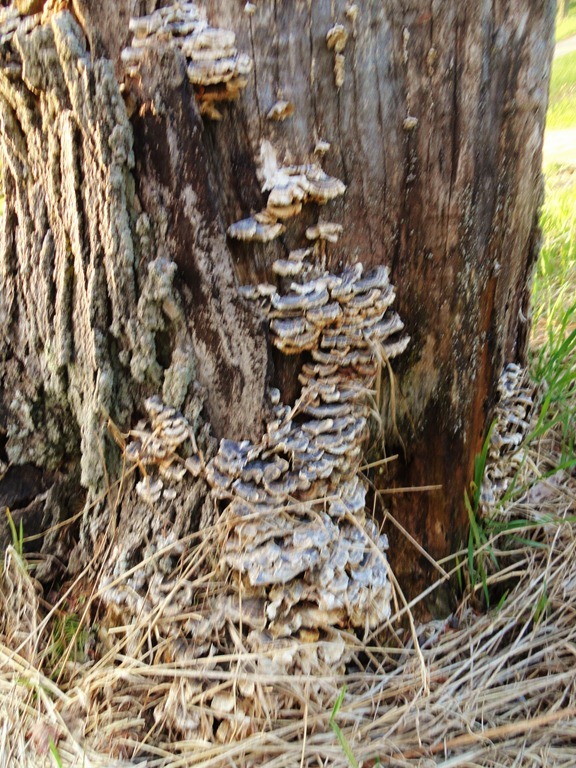 It would have been fun to find a few treasured Morel mushrooms, but it was not to be. This hour exploration in early May,refreshed and reconnected me with a favorite Michigan pastime, something I have enjoyed since I was a child. I retired 9 years ago from teaching and then remarried. Of course that wasn't enough of a life change, so I moved to Wisconsin where my husband Jon resided. This blog reflects thoughts about my Wisconsin and Michigan, hobbies, and family history. As of 2016 we have returned to NW Lower Michigan near family and friends.